Since the past few years, safety equipment has become increasingly popular in the field of alpine skiing. And there was a good reason for this, since for a long time, many people had failed to recognize the dangers lurking on such tours. Sportspeople can speed up to 80 km/h when they carve their trails on the slope. It really requires a lot of luck to master the slalom through people and trees without crashing. Manufacturers such as Evoc, POC, ION or Scott always take the increased safety requirements into account. With a wide range of ski and snowboard protectors, as well as a numerous helmet versions, they provide for all the safety that is needed. The spine is a very sensitive and endangered part of the body. 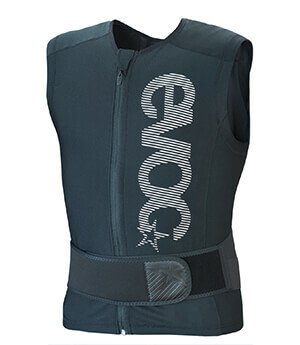 Protector vests for the torso outstandingly protect the back against falls. Safety and health come first, since you don´t want your ski tour to end with an injury to the spinal cord. While helmets have become a common part of the equipment, protective trousers and wrist protection have not arrived this level yet. But especially those who like to go to fun parks will rely on their protection. Safety equipment do not only offer protection against injuries, but they also provide you with comfort. Thus, due to protectors, falls will not be felt as painful as without their safety. Some years ago, protectors and safety equipment was made of unsightly plastic. However, nowadays, only extremely sophisticated material comes into use. Now, instead of hard shell they are made of foam, since it is extremely soft. Yet, it still offers a lot of protection and safety as it hardens in case of a fall. Protector vests and ski helmets are very breathable and offer high safety at the same time. In the end, the intended purpose as well as the individual safety requirements determine, which protector should come into use. Since a complete protective gear consists of various parts, the individual parts can be combined according to personal preferences. Great protection while being lightweight for ski tours, very high safety on the slope and in fun parks - you will definitely find what you are looking for.